This entry was posted in Art, NYC: A Users Guide by Exile on Pain Street. Bookmark the permalink. I’m not going to lie! I skipped over the surgeon’s report. Your intro to it was enough info for me. I’m glad you walked out the same day and are how re-cooperating. I thought I should warn about the surgeon’s report. It’s absolutely fascinating to read but it’ll make your flesh crawl. Okay, having said that, could you live with any of these pieces? Or do they all stink? There are a ton of really good ones being auctioned tonight, including a good Rothko. I left out a funny backstory. Maybe I’ll add it to the next post. These pieces were from a private collection that was PROMISED to the Seattle Museum of Art. The guy died, the family got hold of the art and guess what? Up for auction. The SMA got nothing. Glad you are recovering without complications. I didn’t expect a Post so soon. The description wasn’t so bad reading, but I knew what it was going to say since I had a similar procedure. Can’t wait for more Art results. Because of all your previous pics I can instantly recognize most of the Artist’s work. The Owl looks like a photo of a carved wood statue of an Owl. The more I stare at the Hopper the more details I see. I also think of the good these millions could do for the poor. Also the millions our Government spends/waste every day on special investigations. It could be spent on Art education. So funny you should say that! That’s EXACTLY what I thought that owl was too! Wood. It sure looks like wood in person. It’s only after I read the lot description I realized it wasn’t. Fooled me good. I didn’t understand half of what I was reading but it sounded awful. And the fact that those things were done to poor me made it hit a little too close to home. Can you believe they can do this stuff? The next post will be even BETTER. Although that Hopper is the big ticket item. Nothing else will sell for that much. It’s a beautiful painting. So sad that it’s the last time I’ll ever see it. There’s some lovely poetry in there (“Then, very soft fragments…”), even a little French (“en bloc”). Glad it went well. I go under next Thursday. Reading the David Sedaris diaries. You sound like him sometimes. Not the first time I’ve thought that. It didn’t seem poetic when I came out of my aesthetic haze. It hurt like hell for a while. But all systems are go. The body is an amazing thing, as you will soon see. Sedaris has the career I could’ve had if only I’d had a little ambition. 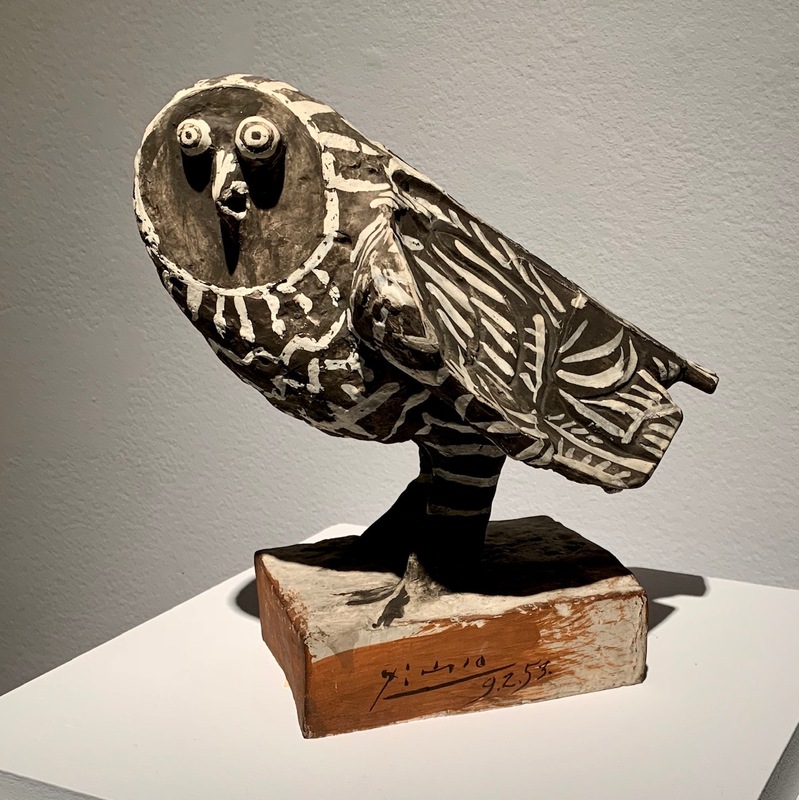 I saw the Picasso owl price at first as $2,412. For two beats I actually got excited that I could someday own a Picasso. 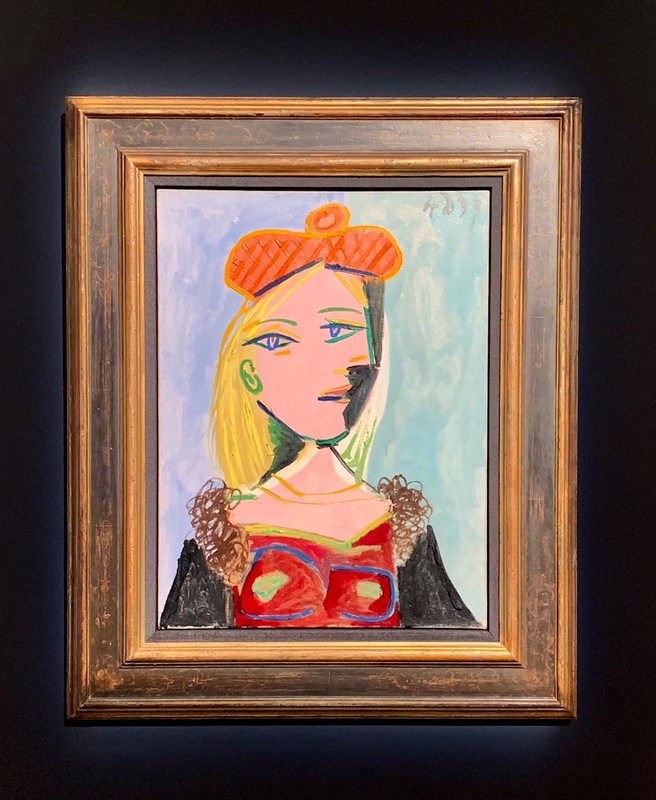 At some point, that Picasso did cost $2,412. We missed the boat. It’s not our fault. We probably weren’t alive or, if we were, didn’t know how to get our hands on $2,412. The body is an amazing, resilient thing. We could probably take a lot more abuse then we give ourselves credit for. Thankfully I didn’t understand the surgeon’s report – too many long words, but I’m very pleased that you tolerated the procedure well!! Meanwhile, Picasso is a bit like Madonna really, isn’t he? I didn’t understand it either but it sounded insidious, didn’t it? I think it was the long words and the tone. So cold. Picasso is Madonna. Has anyone ever seen them in the same room together? The description of that procedure is awesome, and yes i’m fascinated, reading it makes me wish there was video to go along with it cuz it sounds rather interesting… that said the 14yr old in me can’t help but giggle at the incision made in your annulus… the whole part about picking bits out of your back had me thinking of that game Operation, i wonder if the touched the sides if a buzzer went off and your nose glowed? My feelings for Picasso have evolved. I was dismissive of his work (can you imagine?) but have since seen the light. What a grand scope. Guys like Rothko and Pollack had NO scope. Great artists, but no scope. There are videos of this procedure on YouTube. I got about :15 seconds into one and clicked it off immediately. It’s TOO MUCH information before a procedure. I feel like I was reduced to an old Milton Bradley game. My daughters had the modern version of Operation. It’s smaller and it has taken on some toilet humor. Why do they do that? I think we should all strive for one thing. Doesn’t damn well matter what it is. Just one thing to move along, and maybe someone will buy it. Maybe not. Hell’s full of artists. I bet they dance a lot. Large sums of money for art? You know, it’s still better than buying the next tank. Or nuclear missile. At least we value beauty, sometimes I don’t know why. Your back surgery thing… ugh. I wish I hadn’t read that but I do hope you’re doing okay. Hi, Trent. Nice to see you. We did you proud in the mid-term elections, didn’t we? The amounts and pieces seem so arbitrary. I knew a ton of artists, musicians, actors, writers, etc., etc. when I lived in the city all those years and the reason none of them made it wasn’t because of a lack of talent. Poor representation or half-hearted efforts or just plain dumb back luck did them in. How does a piece warrant tens of millions of dollars? I have no idea but I do enjoy watching the big parade. 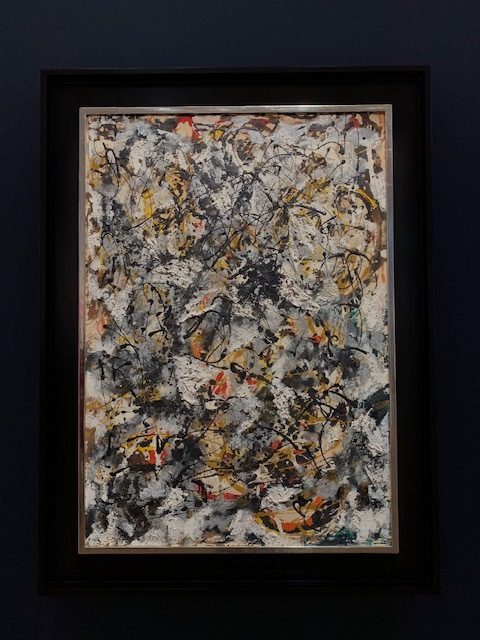 I think I liked the description of your procedure better than the art – though that Pollock is pretty impressive – I particularly like: ‘The L5 nerve root was gently mobilized’, if C3PO was a poet! There is a poetry in trade language. Not just medical but financial, legal, etc. You don’t have to really understand the underlying themes to enjoy the flow and arrangements of words. In some cases, like this one I’d say, it’s better if you don’t understand the underlying themes. This line in the report cracked me up: “The patient tolerated procedure well” – yeah, right. You ‘tolerated’ it… bet you whined just a little in recovery! It’s nice to see you. I was just thinking about you the other day. You’re not kidding about being insured well. I was thinking about posting the cost of the procedure. All these miracles aren’t cheap. Having said that, if it were the 1800s I’ll bet you and I would be in trouble. That line was fake news. I don’t tolerate discomfort well. My favorite one is the Pollock. As for the Hopper, are the girl’s dead eyes intentional? I’m guessing they are. To me, they look like art I could do. That is not a comment on the rest, just the eyes. I’m very much aware that I might sound like an idiot here. That’s because I am one, at least when it comes to art. Good to hear that you “tolerated the procedure well.” Now, rest up and get better. The Hopper girl has dead eyes. The Picasso girl had flounder eyes. Both on one side of her head. I like them both. But I’m glad my wife doesn’t have flounder eyes. There are NO idiots when it comes to art. It’s so subjective. All opinions are equal. Yours is as valid as someone bidding. Congrats on the procedure and don’t rush the rehabilitation. I love that you follow these auctions – it exposes to me something I’d never look at. Funny I look at 1959 Les Paul’s costing £250,000 and think That’s obscene… but $91m… that does take it to a new level entirely! $91m I could make a good fist at tackling homeless across the whole of the UK! Late in responding. So sorry. Multiple distractions. For my rehab, I need to learn to lay back a bit. I’m too quick. I’ll hurt myself. I love attending these auction previews. 2x a year. I look forward to them. It’s an unreal world. I’ll never be able to relate to it but I do like pressing my nose against the glass and looking in. Not boring. I do like Hopper. But not that much! 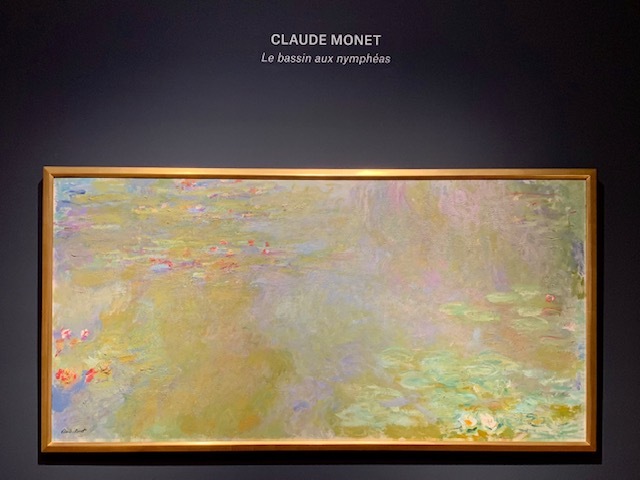 in fact, I pretty much like all these high priced paintings but I’d never invest in one unless I was stupidly, insanely rich and I knew it would be a capital investment. I find it quite sickening that this kind of money is spent on pieces. Hello, dear. Nice to see you. Hopper is not only the master of light he’s the King of Americana circa the 40s-50s. But you’re right about your value assessment. It’s TOO MUCH money spent on just a piece of canvas with some paint arranged just so. I don’t think I could pull the trigger at these prices even if I had that kind of money. I mean…you never know what you’re capable of but I don’t think I could do it. I’m kind of surprised to hear your Thanksgiving good wishes. It’s a major, major holiday out here but I wasn’t sure it’s ever spoken of by y’all. I also skipped the gory operation stuff… already squeamish enough at the very thought of any surgical procedure whatsoever and impressed by anyone who goes there … so- well done on getting through that, whatever it was! Didn’t skip any of the art stuff though…. I liked Picasso’s owl, thought it had something of the self-portrait about it. 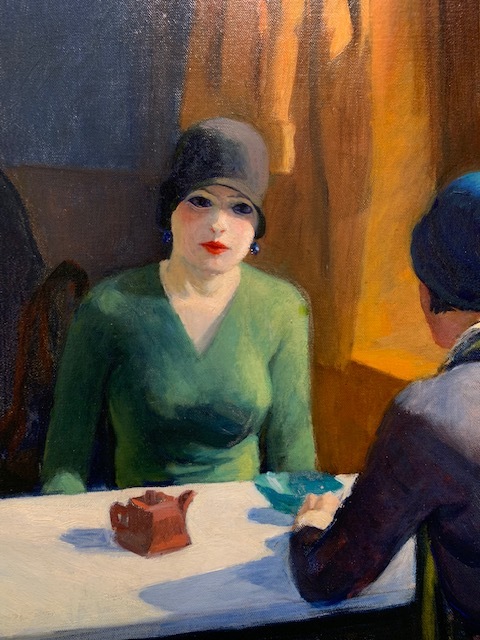 And the girl at the café table… such simple, bold lines and colours, almost childlike in its execution… but so very evocative, you want to be in the café with them, listening in to the conversation. I don’t really know the artist but I imagine many lesser talents have attempted to ape his seemingly straightforward style and found themselves wanting. Thanks for taking the time to comment, pal. Much appreciated. The medical description is fascinating in that I have no idea what any of it means but it sounds really, really terrible. Bones and things. I liked Picasso’s owl, too. In rereading, I think it sounds like I slandered it but It’s a great piece. They had it mounted on a pedestal and lit just right. 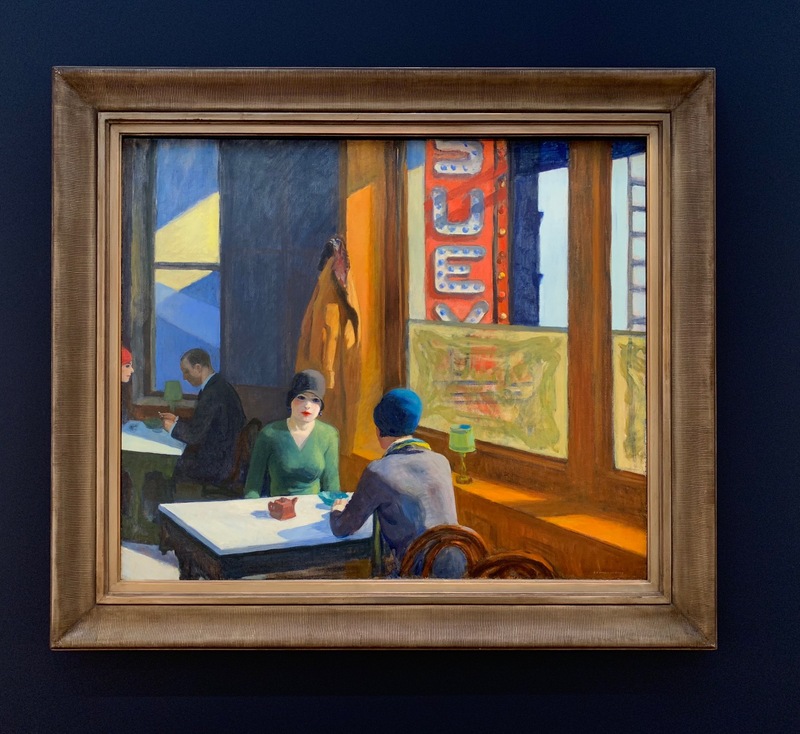 And that cafe painting? Scroll back up and see how he handles sunlight. Makes it look easy but I’ll bet it wasn’t.